Think the new coach is off to a rough start? Andy’s rookie year was no party. Aug. 15, 2016, 2:15 p.m. When Doug Pederson was hired as coach of the Philadelphia Eagles, owner Jeffrey Lurie made a clear indication: His franchise was headed backwards. Specifically, Lurie’s hiring of Pederson — a former Eagles quarterback and Andy Reid disciple — was a sign to fans in the city that the days of steadiness, consistency and quality were coming back. The Reid era, itself, wasn’t making a comeback, what with Reid firmly entrenched in Kansas City. But the sell on Pederson was that he was the next best thing to Reid’s steady (read: successful) hand. Pederson is Big Red 2.0. When Pederson was hired, the Eagles played up his return to the franchise in a big way, using his time as a mentor in 1999 to then-rookie Donovan McNabb as proof, of sorts, that he would be a good mentor to today’s young Eagles. There is one small problem with Doug Pederson’s attempt to recreate Andy Reid’s 1999 launch of his tenure as head coach of the Philadelphia Eagles. In the years since Reid took over as head coach of the Eagles, the NFL has tightened the rules governing training camp and regular-season practices. Coaches simply can’t practice as often or be as physically demanding as they used to be. While Pederson intends to follow the rules, he also made it clear that he plans to adhere as closely as possible to Reid’s training methods. Long term, emulating Reid — who enters 2016 with a 172-121-1 record, all time — could make Pederson a successful head coach. But trying to re-create 1999? That’s a horrible idea! Here’s a look at some of the terrible things that haunted Reid’s first year as a head coach, and how Pederson — and off-the-field circumstances far out of his control — are making 2016 feel way, way too much like 1999. 2016: In Pederson’s first few months as head coach, he had to deal with two major holdout situations, though thankfully for the first-year steward (and the fans) neither was too protracted. Sam Bradford either requested or demanded a trade after the Eagles brought in Chase Daniel, Pederson’s right hand guy — the Doug Pederson to his Andy Reid, if you will — then subsequently traded up in the NFL Draft with the intent of drafting a quarterback. Bradford ended up reporting to voluntary workouts after a week to settle himself down, and the “holdout” was much ado about nothing. Fletcher Cox’s holdout was more, though the Eagles managed to get Cox a monstrous new deal before mandatory camp began. The stalemate took a nasty turn with Smith’s assertion in an interview that aired Tuesday on Philadelphia’s Comcast SportsNet. Smith raised the possibility that the Eagles were reluctant to give McNabb a contract with voidable years because he is black. He cited white quarterbacks like Tim Couch, Peyton Manning, Ryan Leaf and Kerry Collins who got such deals, and a black quarterback, Steve McNair, who did not. Before McNabb was in camp, Reid said, ”I will not allow the signings to be a distraction. We will go forth with those players that are on hand.” A week later, McNabb was signed, and a whole new set of issues would start for Reid. Jun 9, 2016; Philadelphia, PA, USA; Philadelphia Eagles quarterback Carson Wentz (11) and quarterback Sam Bradford (7) and quarterback Chase Daniel (10) and offensive coordinator Frank Reich (right) during mini camp at NovaCare Complex. 2016: We know the story for Pederson. “Sam’s our guy.” Or, he’s not. Bradford re-signed in the off-season, then Pederson brought in Daniel to be his backup, only Daniel is making way more money than a backup of his caliber should, and Daniel got a three-year deal to Bradford’s two-year contract. Then Pederson and Howie Roseman traded up twice to get the second overall pick to draft Carson Wentz, who the Eagles swear isn’t going to play this year. Then Wentz cracked a rib, slowing his development down even more, making the “he won’t play” line seem actually more likely. 1999: The Eagles signed Pederson from Green Bay in February, 1999 on a three-year deal worth around $4.6 million. Sure has a “Sam’s our guy” ring to it. 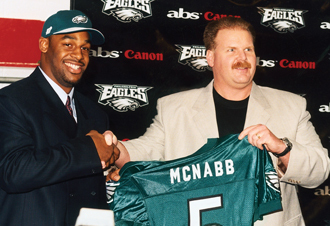 Reid then drafted McNabb second overall in mid April and two weeks later, the Eagles traded Rodney Peete to Washington. Peete had started four games for the Eagles the year before. In August, the Eagles traded Bobby Hoying, who had started seven games in 1998, to Jon Gruden and the Raiders. Pederson started nine games that season, his only year with the Eagles. McNabb started six, while Koy Detmer, the only holdover at quarterback from the pre-Reid era, started one. 2016: Pederson has had his share of distractions already. Two holdouts are one thing, but a player being accused of sexual assault is entirely another. Nelson Agholor had an accusation levied against him by a stripper after he and teammates went to a club on a Friday afternoon following the close of team minicamp. According to a report, Agholor agreed to pay the woman $1,400 for an hour in a private room, but he only paid her $800 because she left early. In July, new linebacker Nigel Bradham was arrested in Miami after an altercation with a hotel employee in which he allegedly punched the man in the nose. The biggest distraction of all for Pederson has been the Lane Johnson debacle, as the starting tackle will likely be out for 10 games after a second PED suspension. He is appealing, but even the NFLPA doesn’t have his back on that. 1999: Reid had many distractions off the field when he was the coach of the Eagles, and several — Terrell Owens comes to mind — that impacted things the field, too. But compared to Pederson’s first few months on the job, Reid’s first year was quiet. That said, the Eagles organization did have a hit-and-run death to deal with. On October 11, 1997, then Eagles publicity man Ron Howard’s wife, Karen, was driving home from a game with their four-year old child when she hit a man on the I-76, killing him. The man, Robert Hoagland, was fixing a flat tire when he was struck. She then fled the scene, washed her car and returned it to the dealership from which she leased it the next day. While the incident took place before Reid’s tenure, the guilty plea happened just before camp and the sentencing happened four days before Week 4. (For what it’s worth, the Eagles started that year 0-4.) Howard eventually served 254 of her 360 days, released the first week of June, 2000. Certainly Reid and Pederson both faced distractions their first year, but outside of the quarterback carousel, those distractions were admittedly very different. 2016: Nobody inside or outside Philly seems to know what to make of Pederson. NFL.com ranked him as the league’s “worst” head coach (which is a clever way of saying least experienced.) As for Pederson’s hiring, fans were less than enthused at the time. Isn’t vanilla better than…rocky road? We’re about to find out. 1999: The general lack of interest in the Eagles in 1999 wasn’t necessarily Reid’s fault. Ray Rhodes had the Eagles in a bad place before his ouster, finishing the 1997 season a woeful 3-13. Reid was hired with no head coaching or coordinating experience. He was an out-of-nowhere candidate and fans were nervous that his lack of experience would lead to another run of awful outcomes. Fans were wrong, obviously, as Reid proved to be a great hire, despite never winning a Super Bowl. But that first game? Yeah…apathy. Apparently the millions of people who were unable to see Sunday’s football game between the Philadelphia Eagles and Arizona Cardinals had some company. Eagles Coach Andy Reid left a large group of media types wondering whether he’d been blacked out during Sunday’s game at his first day-after press conference at Veterans Stadium. Reid spent that first press conference defending the play of Pederson, who was 12-for-26 for under 100 yards in an Eagles loss to the Cardinals that was blacked out locally because the game wasn’t sold out. Fans may be “meh” on Pederson this season, but not selling out a game? Clearly, 1999 was no party for Reid, so if the Eagles new head coach is trying to follow in the footsteps of his old coach, he might want to pick another year.